BGR's burger was dynamite good, featuring a thick, meaty patty and a nice combination of grilled onions, lettuce and fresh tomato that's red like it should be. The patty's grilled flavor is pretty intense since BGR flame-grills their burgers. Sound familiar? It's what Burger King does, which is why this burger takes me back to my childhood and tastes like what Burger King could be if it used fresher, higher quality ingredients. The bun got a little sogged with meat juice, but it's very tasty and still held up pretty well. Although the menu bills it as brioche, it doesn't feel as greasy as the brioche bun at Matchbox. The onions come grilled as standard, which is a nice touch, the cheese is cheddar (a plus) and the bacon adds some smoky saltiness. My only gripe with this burger is that it came overcooked: I asked for medium, I definitely got medium-well. Chris's came medium though and he let me taste his, which was definitely superior in flavor to mine (if we've learned anything from this exercise, it's that "medium" is the best choice for how to cook a burger). Shake Shack's burger wasn't bad. It was also wasn't really great. The burger had good flavor but wasn't very interesting, smothered as it was by a layer of American cheese with some green leaf lettuce, respectable tomato slices and "Shack Sauce," a thousand island derivative. The bun was a little soggy with grease and slightly sweet. BGR - The Burger Joint. 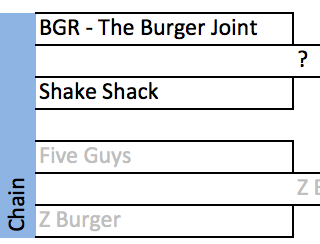 I was expecting BGR would best Shake Shack based on what I've read about it, but I surprised by just how much. The BGR burger was really quite tasty. The BGR burger blew me away. It was great. I didn't know a burger from a place like this could be so good. Shake Shack's wasn't bad, but BGR's was amazing. I also thought BGR had really good service. We went at lunchtime, and I remember a manager-type was on the floor of the dining area almost constantly, tending to customers' needs. He even came by and offered to clean off my area of our table when I finished my burger before you.